2017 Nissan Armada Platinum edition. Capable 2017 Armada is punctuated by the Platinum edition. For the second time in three months, Nissan delivered a 2017 Armada for my review. 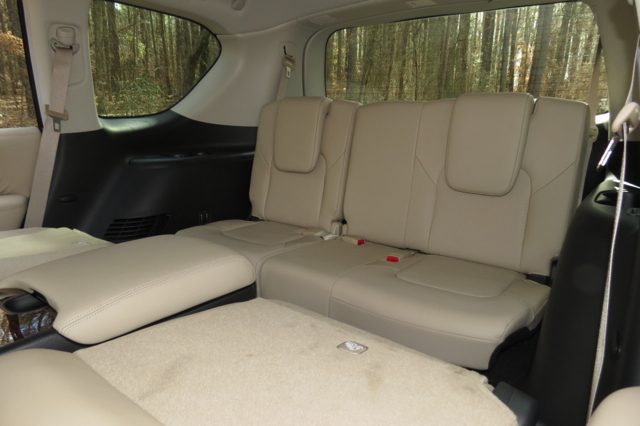 My earlier review offers a thorough inspection of this full-size sport utility vehicle, a model that competes with the likes of the Toyota Sequoia, Ford Expedition, Chevrolet Tahoe, and the GMC Yukon. 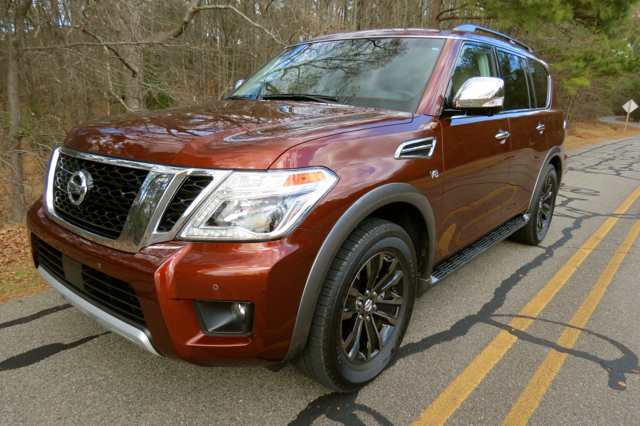 In other words, the Nissan Armada competes in a limited segment, one where customers want all the girth and heftiness found in a big SUV — the better to hold seven or more passengers in comfort, carry generous amounts of cargo, and to supply exceptional pulling power. All five models in this segment deliver as advertised. Nissan offers three trims for the 2017 Armada: SV ($44,900), SL ($49,650), and Platinum ($57,590). Add $1,095 for destination. If you prefer all-wheel drive, add $2,900 to each model’s base price. 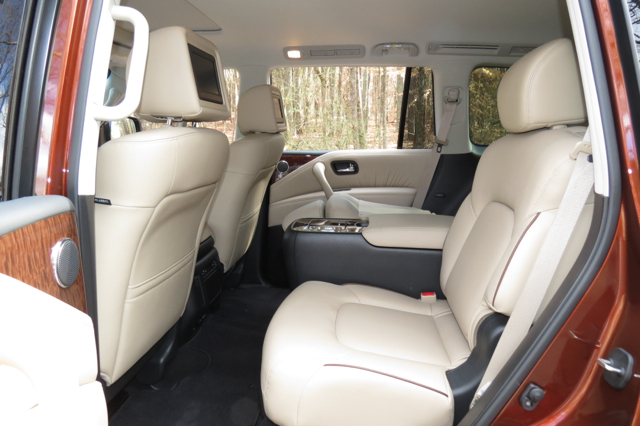 The Platinum trim represents luxury as evidenced by the standard equipment offered, including 20-inch machine-finished tinted aluminum-alloy wheels, a three-zone entertainment system with dual 7-inch monitors, heated and ventilated front seats, and a power sliding moonroof. 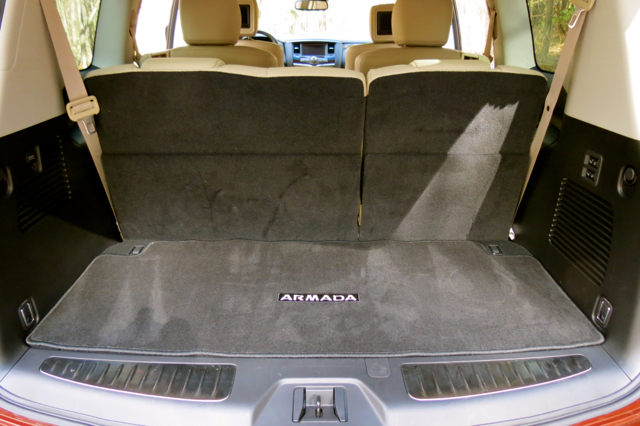 That’s not all you’ll find in the Armada Platinum. This model also comes with a front and rear sonar system with eight embedded sensors tasked with searching for stationary objects to help you avoid them. Audible warning notification is supplied you when you venture too close. 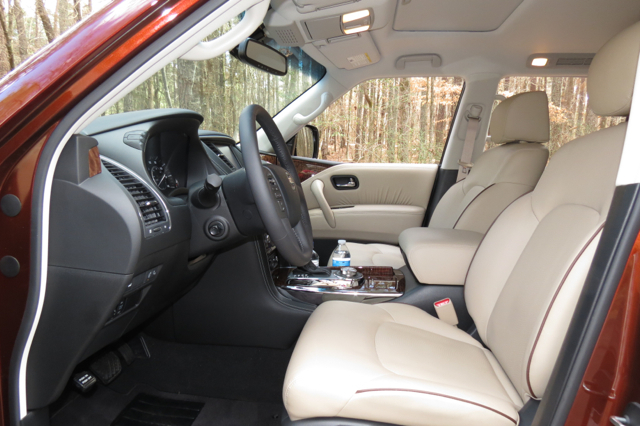 You’ll also find dual power folding heated side mirrors with puddle lamps, a power rear lift gate, an interior memory system, a heated steering wheel, and wood tone trim. The Platinum trim also includes dual-zone automatic climate control, a navigation system with traffic and weather reports, predictive forward collision warning, forward emergency braking, lane departure warning and prevention, blind spot warning and intervention, backup collision intervention, and moving object detection. In other words, all the advanced driver assist features are included. 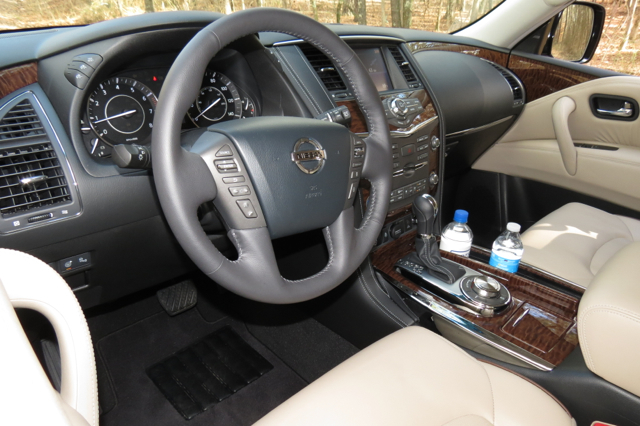 Otherwise, choose one the Armada SL trim and you can order these features as part of a $1,770 technology package. 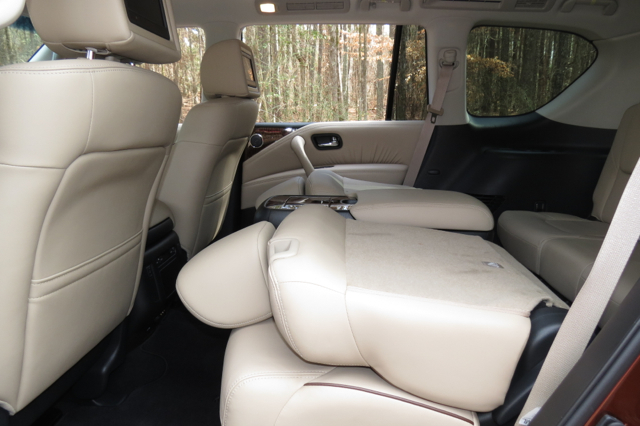 The only package available for the Armada Platinum supplies second-row captain’s chairs with a center console for $450. Fully optioned, you’ll pay about $62,000 for the 2017 Armada — that is, before dealer discounts are taken. 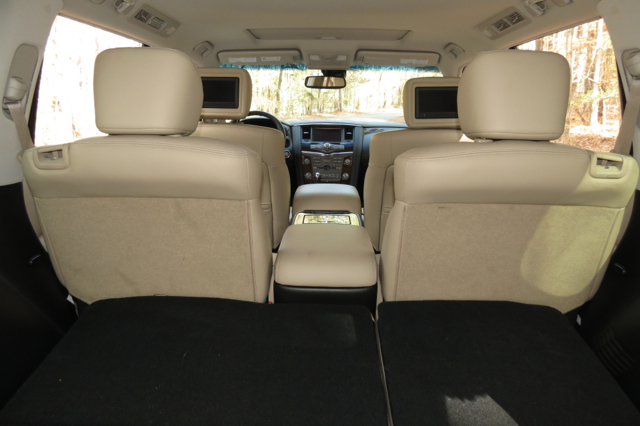 Available leather, wood trim, and a gigantic interior provide the Armada with all the trappings of a premium full-size SUV. Other benefits include very comfortable front seats, a commanding view of the road ahead, a quiet ride, and inconsequential harshness and vibration. 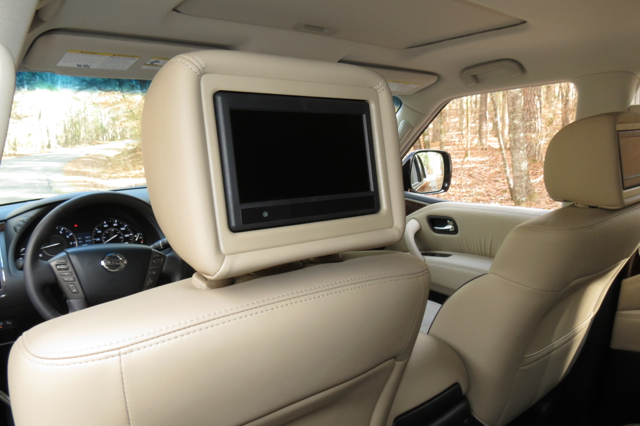 As for the audio system, a 13-speaker Bose package is standard across the model line. 2. Performance supplies what you expect in this segment. A powerful engine is the hallmark of SUVs in this class. 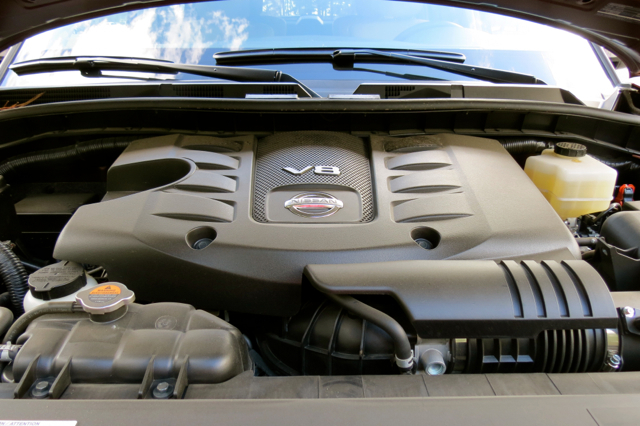 For 2017, Nissan updated its 5.6-liter V8 engine, adding direct injection gas and variable valve event & lift systems. As a result, horsepower increased from a fairly tepid (for this class) 317 hp to 390 horses. This engine also has an output of 394 pound-feet of torque. Combined, you’re never at a loss of power. The other important change has to do with automatic transmission. The previous five-speed automatic was replaced by a seven-speed automatic transmission. The powertrain combination is entirely suited for this model and puts the 2017 Armada on par with its rivals. When it comes to towing, the 2017 Armada is in the thick of things. It is ahead of the Sequoia’s 7,400-pound towing capacity and matches what both the GMC Yukon and Chevrolet Tahoe deliver. Only the Ford Expedition beats the Armada as it utilizes a twin-turbo V6 engine to achieve its 9,300-pound towing capacity. 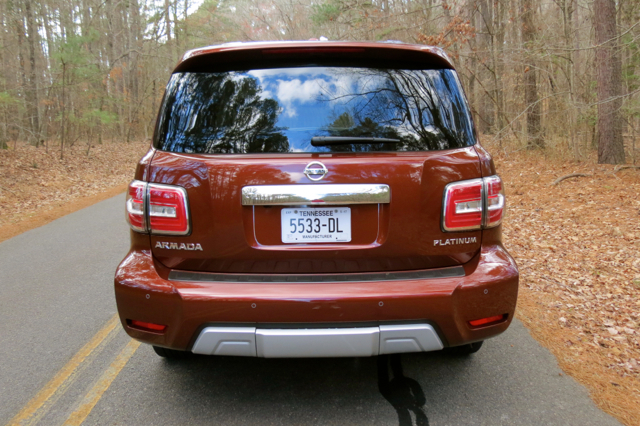 Press hard on the gas pedal and the Armada supplies a confidence-building roar as it moves away from a full stop. Power keeps delivering as you work your way up to highway speed. Once you’re on the highway, you’ll find ample passing power to help you stay ahead of the crowd. Steering feels weighted, although handling is a breeze with the wheel turning whichever way you want with relative ease. Braking is firm to the touch, bringing this near-three-ton workhorse to a firm and confident stop. Shoppers who might have expected the 2017 Armada to share its platform with the current-generation Titan or Titan XD are in for a surprise. This model sells as the Nissan Patrol in global markets, an SUV with a slightly smaller wheelbase, but longer overall than 2015 and earlier Armadas (no 2016 model was produced). The change results in a healthy 20-percent increase in torsional rigidity, something you’ll notice when navigating twisty roads and wherever body roll is a factor. This feature also makes for a safer vehicle, although no official crash testing has been conducted. 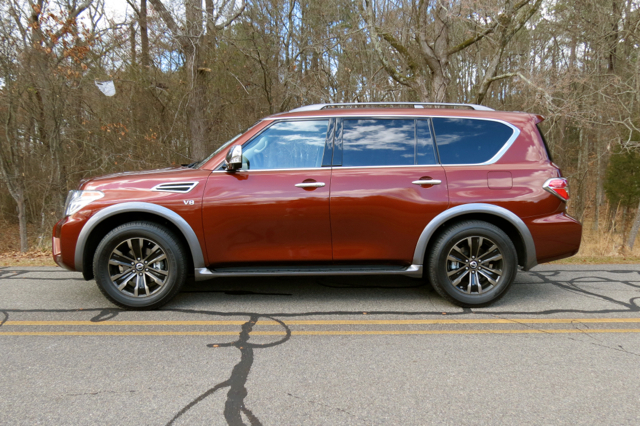 2017 Nissan Armada Platinum photos copyright Auto Trends Magazine.